I tried to follow the rules that I set for myself Friday when it came time to paint this one. Only mask the waterfalls, and the trains. The background and cliffs I will do in two passes – no more – both washes. The mid ground will be three passes, a wash, a wash of shadows, and a final pass with detail. The trees in the foreground will be a single pass, only detail, hopefully that will make them appear more like bare branches against snow. When I masked off the waterfalls, I stripped some masking tape to protect the cliffs on the sides so that when I splattered the masking fluid, it didn’t get on the cliffs. I think this was successful and helped to push the mist behind the cliffs. This is something I will be exploring more. One downside to the reduced use of the masking fluid is that I have become accustomed to washing with little control – trusting the masking fluid to preserve my whites. I basically completely forgot that I wasn’t using masking fluid, and washed right into the snow banks that I wanted to preserve. That had a huge impact on the composition, as I basically lost all of the snow in the picture. I need to continue being judicious with the masking fluid AND preserve my whites in the wash.
Only using washes (wet in wet) in the distance was a good idea. The reduction in detail definitely helps establish the illusion of depth. Unfortunately, the colors are far too saturated, which kills the effect of atmosphere. I will try the next version with a nearly complete grey wash in the distance. I like the gold color on the hill in the distance, the light is striking that hill from around the corner, and that coloring helps communicate that. However, the color is again too saturated, and as a result it looks like there is no snow at all on either cliff. I need to leave my paper to keep the snow in this painting. The mid-ground worked well I think. I tried to paint the trees in a semi-wet wash, and came back later to add details, which I think worked. Again, I did not leave enough white – so the snow all melted. The trees in the foreground are a complete disaster. The foreground is where this painting goes to die. I want to preserve whites in the trees to keep the snow in the foreground, but this inevitably causes the foreground to retreat. I don’t know how to keep the whites, and allow it to appear to come forward. I need to look at some of the recent posts by Rick Surowicz to watch how he handles snow so beautifully. 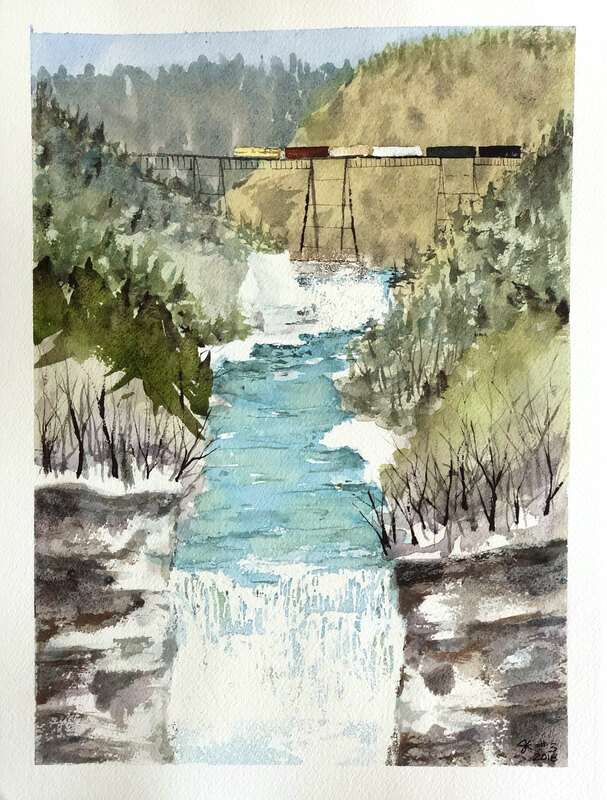 The river worked well without the masking fluid I think. The composition itself is awful in this version. The lines are nearly vertical throughout. I need to keep an eye on that to help draw the “s-curve” that I am seeing in my mind’s eye. I am going to try this again, and attempt to employ the lessons I have learned so far. This time, I am going to use one color only – so I can really focus on the value contrasts and composition. I think I want to use a completely unrealistic color so I immediately ruin any attempt on my part to get distracted with the colors – I need to focus on composition and value structure on this painting, and work color in once those two elements are refined more.